Minutes before launch its fourth launch scrub, the space shuttle Endeavour waits for liftoff on Launch Pad 39A on July 12, 2009. Thisstory was updated at 10:00 p.m. EDT. CAPECANAVERAL, Fla. - NASA?s latest launch delay for the space shuttle Endeavour onMonday marked the fifth failed attempt to get the beleaguered mission off theground. The tally may seem high, but it is not the record for the most vexedshuttle flight. That titlebelongs to two NASA missions, the STS-73 flight in 1995 and the STS-61C in1986, both aboard the shuttle Columbia. Those missions each endured sixscrubbed launch attempts and lifted off on the seventh try, according to spacehistory and artifacts expert Robert Pearlman, who founded the Web site collectSPACE.comand is a SPACE.compartner. If NASA cansuccessfully blast off Endeavour on Wednesday evening, its sixth time will be acharm. The shuttle would have to miss two more launch attempts and lift off onthe eighth try to take the title for most scrubbed mission. Endeavour?s newlaunch time is late Wednesday at 6:03 p.m. EDT (2203 GMT). Endeavourwas originally scheduled to launch June 13, and is now running just over amonth late. That delay pales in comparison to earlier missions, some of whichwere held back for years after the Challenger and Columbia disasters, accordingto NASA. The agency officially marks launch scrubs by how many times a shuttleis fueled, not the number of launch date changes, a NASA spokesperson said. A 2007analysis of shuttle launch delays by the Associated Press found that the NASAspacecraft launched about 40 percent of the time. The AP analysis found that ofthe 118 shuttle flights that had flown at the time, 47 lifted off on time. Morethan half of the delays were caused by technical malfunctions, while foulweather made up about a third of the delays, the Associated Press reportedthen. NASA haslaunched 126 shuttle missions, including eight flights which have lifted off sincethe 2007 AP analysis. The space agency currently plans to launch eight moreflights by September 2010 to complete construction on the International SpaceStation. Endeavour?sSTS-127 mission is NASA?s third shuttle flight of 2009. The shuttle Atlantislaunched toward the Hubble Space Telescope on May 11 on the first actual try,but the mission had been delayed since Fall 2008 due to a non-shuttle failureon the telescope. 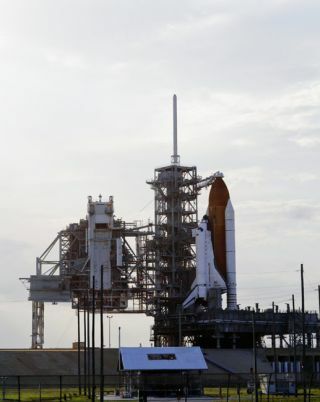 The shuttle Discovery lifted off on March 15 after a four-daydelay due to a hydrogen gas leak similar to Endeavour?s. Repeatedstalls aren't just frustrating, but expensive. For everyone-day scrub when a shuttle mission is called off after its external tank hasbeen loaded with fuel, NASA spends about $1.3 million, said NASA spokeswomanCandrea Thomas. Paying for the wasted liquid hydrogen and liquid oxygenpropellants costs about $500,000, and $700,000 goes toward paying personnel,she said. Over time,repeated delays can have a ripple effect across NASA?s later shuttle missions,since the launch schedule must sometimes shift to accommodate a difficultflight. Endeavour?slaunch delays have already prompted NASA to delay the following shuttle flight,STS-128 aboard Discovery, by a few weeks. But overall, it should not affect theagency?s plan to finish space station construction and retire its three-orbiterfleet next year, mission managers have said. Endeavour'sflight plans were foiled twice in June by a gaseous hydrogen leak, which hassince been repaired, and threetimes by weather. Plans to launch on Saturday were abandoned to allow moretime for ground crews to investigate possible lightning damage from strikesthat occurred the afternoon before. Sunday and Monday's liftoff attempts wereboth cancelled because of thunderstorms that approached Kennedy Space Centerhere, threatening both Launch Pad 39A where Endeavour stands, and the ShuttleLanding Facility which must remain clear for an emergency landing if needed. NASA hopesEndeavour can launch Tuesday, but must replace a disconnectedthruster cover on the shuttle's nose in time. If that is not possible, NASAmay aim for Wednesday, if the Russian Federal Space Agency agrees to postpone aplanned launch of an unmanned cargo ship. The STS-127 mission is a spacestation constructiontrip to deliver spare parts and the last segment of the Japanese Kibo lab. SPACE.comis providing continuous coverage of STS-127 with reporter Clara Moskowitz atCape Canaveral and senior editor Tariq Malik in New York. Click here for missionupdates and SPACE.com's live NASA TV video feed. Live launch coverage willbegin at 1:30 p.m. EDT (1730 GMT).